Every few months, I enjoy posting a cocktail recipe, something a little different from my usual recipes. In warm weather, there seems to be no end of eye-catching, luscious librations. Winter cocktails that appealed to me were few and far between for me, at least until I discovered the sidecar. Cognac, Grand Marnier and Meyer lemon juice – what’s not to like? To be fair, I sampled a few recipes before settling on Ina Garten’s from her “Foolproof” cookbook. I come back to Ina’s recipes again and again, but always make an effort to give them a twist that makes them mine. Our tree is loaded with Meyer lemons, and I think they always add something special to whatever I am making in the kitchen. The garnish for this cocktail, a cherry, really threw me at first. Last winter when I was considering posting a manhattan, I had searched far and wide for the highly recommended amarena fabbri cherries. These are wild cherries in heavy syrup and usually come in a very pretty blue and white ceramic jar. It turns out that for about $10, Amazon is happy to send you a small jar. Unfortunately, these cherries seemed both too small and so syrup-y that they “bled” through the cocktail. I wasn’t wild about Ina’s suggestion to soak dried cherries in yet more cognac, since this is one potent cocktail. 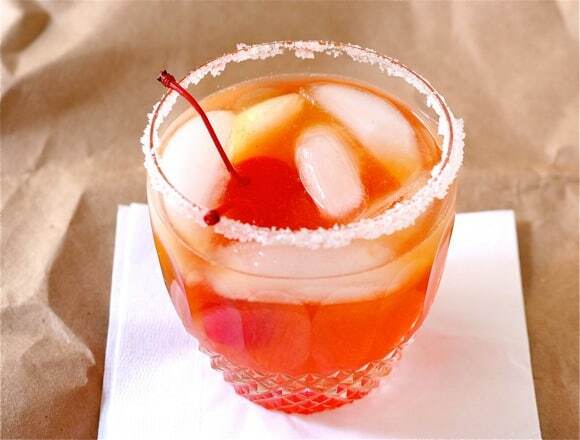 So, I turned to the classic maraschino cherry, just as I had enjoyed in Shirley Temples are a kid. My mother used to warn me that each cherry had a drop of poison in them – something never confirmed – but I refused to give them up. Today, just as long ago, I prefer the stemmed maraschinos. Since we didn’t seem to own a shot glass, I had trouble with Ina’s ingredients measured in ounces. I translated into 1/3 and 1/2 cup measures and the cocktail passed my test. TIP: Triple sec is a less expensive and very acceptable substitution for the Grand Marnier. Pour the juice of 1 lemon into a small dish. Pour the sugar into another. Dip the edge of each glass into first the lemon, then the sugar. Set the glasses aside while you make the drinks. Mix together the cognac, lemon juice and Grand Marnier together in a 2-cup measuring cup. Fill a cocktail shaker ¾ full with ice, add the the cocktail mix and shake for 30 seconds. Add some ice to the sugar-rimmed glasses and pour the cocktails. Garnish with cherries. Maraschino cherries are one of my little guilty pleasures. Probably because I loved Shirley Temple’s as a kid too. Your photo is really gorgeous!!! Love! Such a pretty picture! I too love a maraschino cherry, have a craving for one now! I ate several cherries while I was making and shooting – just like a kid. I would love to serve one of these to you and your delightful husband – come to San Diego and I promise more. Hic – I will pick you up – we are 10 minutes away from the San Diego airport. Hey, that sounds like a plan. I know, you are the second person I trust to report on the Luxardo – next cocktail, beacause I could not find them on line. Yep, I know you are right. I wonder why they call this drink a ‘Sidecar’ – maybe because we are ‘sidelined’ by drinking so many good things? Anyway, only one way for me to find out- by drinking one! New Years eve is coming soon! Good question, Fran – I have no idea how the cocktail got its name. Happy New Year!